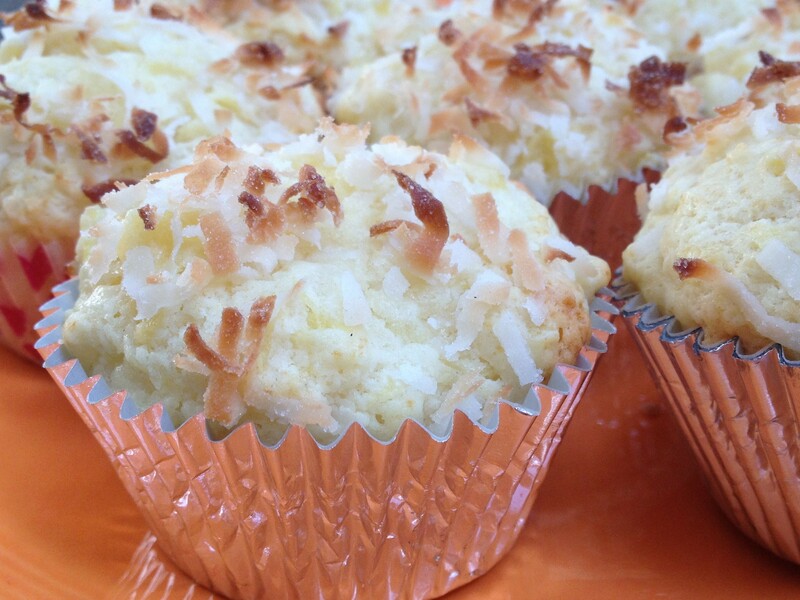 The fabulous Deb at Smitten Kitchen posted a recipe for Double Coconut Muffins recently, and while they do look wonderful exactly as is, she did say the recipe has a high potential for adaptation. That’s all I needed to hear! My boys all love pina coladas. We are strictly a milk and water family, so if there is ever juice or soda in this house, you know we’re having a party. A few summers ago, we brought Logan’s friend on vacation with us to Vermont, and at every restaurant, he would order a (virgin) pina colada. Seven days on vacation = a lot of pina coladas. Nate and Andrew quickly picked up this pina colada habit, and since Mean Milk and Water Mom was on vacation, she let them have a few. The following September, Andrew started Kindergarten. And when asked what his favorite food was on his All About Me worksheet, he drew a pina colada, complete with umbrella and ornamental pineapple chunk. Proud Mom Moment right there. These muffins are great for breakfast. They are sweet but really not too sweet. In fact, if you are looking for a Starbucks or Panera style muffin, this recipe isn’t for you. There is only 1/3 of a cup of white sugar in them, plus one cup of drained pineapple. I love that this recipe uses coconut oil which is so good for you (blahblahblahDrOzsayssoblahblahjusttryitokay?) and while I frequently use coconut oil to make popcorn or to stir fry, I have never baked with it and I was excited to try. Preheat oven to 375°F. Either grease 10 muffin cups with butter or coconut oil, or line them with papers. 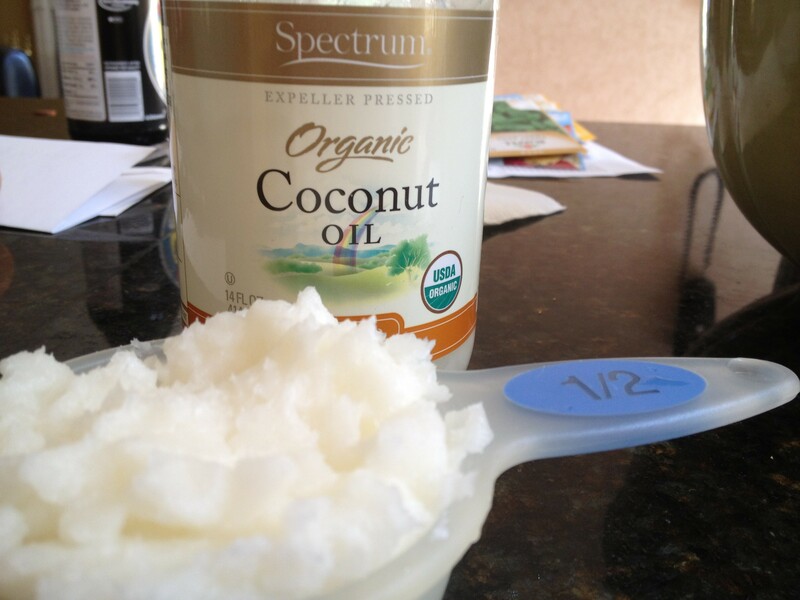 In a small saucepan on medium low, warm your coconut oil until it melts. It should still be on the cool side. Remember, too warm will coddle the egg, and then…yuck! In a medium bowl, whisk together flour, baking powder and salt. Stir 1/2 cup shredded coconut. In a separate bowl, whisk together egg, sugar, coconut oil, pineapple, rum, yogurt and vanilla. Stir into dry ingredients until just combined. Divide batter among prepared muffin cups then sprinkle the top with remaining 1/4 cup coconut, about 1 to 2 teaspoons on each. Bake until a tester inserted into the center comes out clean, about 20 minutes. Transfer muffins to a rack and let cool. This entry was posted in Desserts and tagged breakfast muffin, coconut muffins, coconut oil, pina colada muffin by Mom Mom's Apron. Bookmark the permalink. As I am sitting at my desk taking a break from work I see this post and my mouth is watering…this has been added to the FOREVER long list of things I have to make. If you try it and it works, let me know, and I’ll add GF directions to my notes. Or you can just live in FL and your coconut oil is usually liquid except for that time in winter before you turn the heat on full blast because you can’t handle a bit of chill.